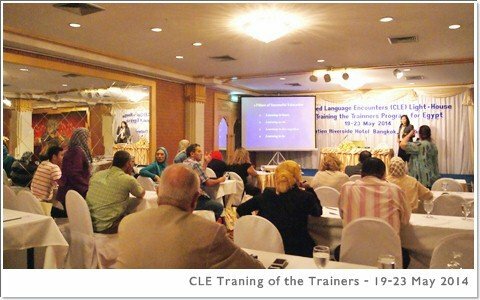 The CLE Training of the Trainers Program for new Egyptian key-personnel in Bangkok, 19-23 May, 2014 under Rotary Lighthouse Literacy project, was funded by the Government of Egypt, UNESCO and Local Rotary Clubs in Egypt. The training organized and provided by Literacy Rotarian Action Group Committee. From Adult Literacy, the Ministry of Education. On the first day training, theoretical concepts of teaching and learning of literacy in details were emphasized along with research-based studies that work. 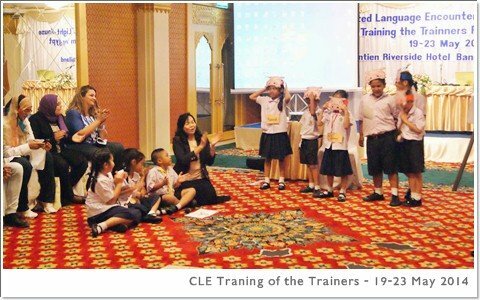 CLE Teaching Demonstration in actual situations was conducted by the trainer with Thai children at beginner level as a sampling group using English language as a foreign language in teaching in order to let all trainees understand the communication between the teacher and students. It could also prove that students could learn other language through CLE effectively step by step. The trainees practiced teaching in different groups of Thai students with their native language (Arabic). Not very long, the students could speak, read and write Arabic as they could do in English sampling group. The trainees also learned how to make an effective language tests to evaluate and assess students’ language performance. As most trainees had done in the past, after the training, the trainees returned to their schools and started CLE teaching program to their own students. For a few years, when the trainees are keen enough, they are expected to volunteer and become the trainers to other in-service teachers in or outside their local areas. Lighthouse strategies were implemented to make the projects sustainable in schools and in the communities/villages as “Education for All” program in order to make students become literate and help themselves in the future for their own life skills through their lifelong learning. CLE was introduced in Cairo Egypt many years ago by Dr. Saowalak Rattanavich as a volunteer supported by rotary international. 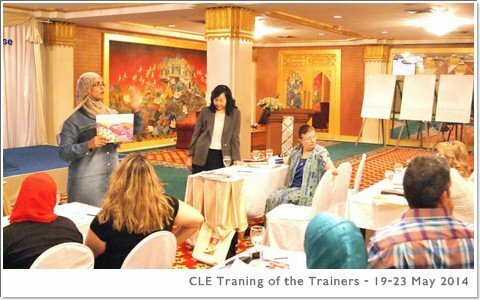 She applied the teaching experiences from CLE Literacy Project in Thailand. The model of training was developed and implemented effectively elsewhere as the example of the recent training for Egyptian key-personnel. Egypt is another country which is expected to become the CLE lighthouse for other countries using Arabic language. Egypt being a developing country with a long history of political occupation and unsettlements suffers from a very high rate of illiteracy (between 30-40%) and more in the urban areas. The only one solution is to offer a proper Functional Literacy Learning for people as "Education for all"
You can download our handout of how to apply CLE (Concentrated Language Encounter) Methodology with Functional Literacy from the link below. Functional Literacy using CLE (Concentrated Language Encounter) Methodology. Program by far the most successful Rotary mass literacy project has been in Thailand, where the literacy program for elementary schools that was developed through a 3-H Grant turned gross educational failure into high success in the most difficult region of that nation. As a result, the Ministry of Education adopted that literacy program for use throughout the whole nation. The success of the project was built on a major strategy known as “Concentrated Language Encounter” (CLE) for literacy teaching and for developing and implementing literacy programs in different contexts. Concentrated Language Encounter (CLE) techniques for literacy are in particularly effective in educationally difficult circumstances, such as are found in developing countries. This was first proven in several large-scale Rotary literacy projects in Thailand, led by PDG Dr. Richard Walker of Australia and PDG Assoc. Prof. Dr. Saowalak Rattanavanich and PDG Noraseth Pathmanand of Thailand. Concentrated Language Encounter (CLE) programs are “immersion” programs in which students are constantly involved in doing new and ever more difficult things with language in the course of group activities. What students are expected to do is first modeled by the teacher who then provides less and less support as students become able to take on more responsibility for what they need to do. Overall teaching objectives are for less experienced learners and beginners. CLE can be used for illiterates, adults, and young children. The overall strategy for stage 2 is for students to analyze a model text of a particular type; develop an understanding of its characteristic and uses, and compose and use a text of that type of themselves. The functions of the stage 3 program are to develop the ability to use written language to generate and structure new knowledge, and to broaden further the range of texts that students have learnt. Students need to learn how to organize knowledge for themselves in ways that are conventional to subject areas. 2.1 Students need to produce a writing plan from reflecting on both what is required of them in the writing task, and what is available from the text. 3.1 Each student fills in an individual writing plan with information that was noted down from reading the text. 3.2 Groups reconvene to negotiate a common set of notes for the group. 4.1 Students write a first draft of a text that aims to realize the writing task goal. 5.1 Reviewing student examine their texts for adequacy and suitability in relation to the task goal. 5.2 Re-drafting: students redraft their texts, in the light of the review. 5.3 Polishing: the teacher may lead the whole group to polishing a group text, discussing ways of eliminating surface weaknesses. 6.2 Elaboration: the teacher organizes independent activities for groups of students or individuals in some aspect of reading and writing. The CLE Lighthouse projects in the Philippines, Thailand, Bangladesh, and elsewhere in the world demonstrate that meaning-oriented, activity based, learner centered teaching of literacy really works. The two main methods highlighted in previous publications are story dramatization and classroom activities that involve reading as a key component, such as making toast and spreading peanut butter on it. The students learn very fast from both types of encounters. The key is the pragmatic connection between printed words and their demonstrated meanings. The language encounters are concentrated in several ways: for one, the language is rich and varied; for another, the activities and stories are engaging and easily dramatized; and for another, they always address real needs and interests of the learners. Teachers and learners everywhere in the world can benefit from studying and using the CLE methods and materials. I am glad to recommend them. Visitors to this web site may also find it interesting to read about the CLE program in the books: Rattanavich, Saowalak, Walker, R. F. & Oller, J. W., Jr. (1992). Teaching all the children to read. London and New York: Open University Press; and Oller, J. W., Jr. (Ed. ), (1993). Methods that work: Ideas for literacy and language teachers. Boston: Heinle and Heinle Publishers. I am most happy to endorse the CLE approach and to commend its developers and the Rotary Foundation for their support! For some even more recent developments in reading theory and applications please visit my website at http://www.ucs.louisiana.edu/~jxo1721/index.html and view the video highlighted there on the front page. John W. Oller, Jr. holds a PhD in General Linguistics from the University of Rochester, New York. He was accelerated to tenure and the Associate Professorship at UCLA within two years of completing his PhD. From 2004 until 2013 he held the Doris B. Hawthorne/Board of Regents Support Fund Professor IV at the University of Louisiana at Lafayette. Oller designed and founded the PhD in Applied Language and Speech Sciences at UL in 2001 with core requirements in theoretical semiotics; was one of “100 Stars” honored at the Fresno City College Centennial in 2010; received the MLA Mildenberger Medal in 1984; and his former doctoral students occupy positions of distinction at universities in California, Georgia, Hawaii, Louisiana, Pennsylvania, and Texas as well as Thailand, Korea, Japan, and Germany.